Woman creates a life-size wedding-dress cake – and it's far too pretty to eat! She showcased her creation at the Alexandra Palace Cake International competition. In case your decision to start a strict no-sugar diet deprives you of the privilege of biting into a soft and fluffy, rich and decadent chocolate and buttercream slice of heaven, this confectioner has created a masterpiece to feast your eyes on. 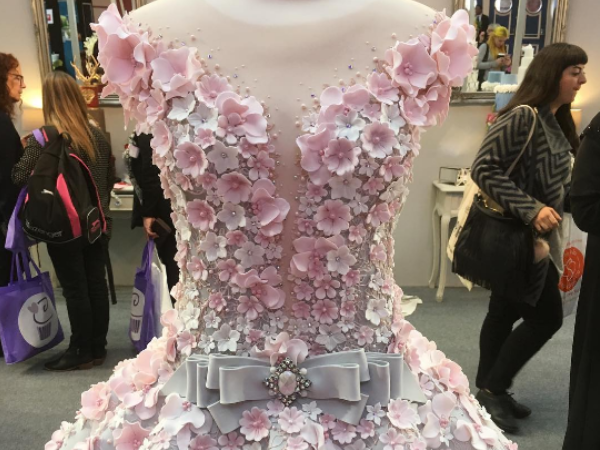 Emma Jayne of Emma Jayne Cake Design replicated a stunning couture piece by designer Mak Tumang and showcased her creation at the Alexandra Palace Cake International competition in London, the world’s largest cake competition. The theme this year was Wedding Gowns Through the Ages. Not much is known about how Emma managed to achieve the intricate lifelike details on the cake dress but she reportedly used a dragéekíss, a new patented cake-decorating tool. This wasn’t the cake creator’s first year at the competition. Her previous creations are equally as impressive to say the least.